Happy Monday everyone. I hope you had a fabulous long weekend and this week treats you well. I asked a few of my special friends to do a few guest posts for me. The first one is from Siobhan from For the Love of Nail Art. I have told you many times how awesome I think she is and she has proved it yet again. There is no reason or rhyme for this nail art except that M asked me to guest star for her. I’ve already showed you how I see her and from that post you should know she also likes polka dots… and pink. I think one of these days M isn’t going to ask me to guest for her because I also do PINK but it’s a great excuse for me to pick one of my many pinks to wear or showcase. And just so you know, I wanted to do nail art inspired by Fat F@#$ Frank but that’s kind of hard and he’s black… so a plain black mani wasn’t going to cut it for me. I love FF-Frank! He’s such a rockstar. My other idea was to do a pixiedust inspired nail art but I didn’t feel like it because it became a hot mess. I saw something similar on a nail art page on Facebook and I wanted to try out the design so doing this for M was perfect. Wipe nails down with white vinegar to prevent polish peeling. Two coats of Tip Top’s Tickled Pink. A pretty, slight metallic pink. Leave to dry. 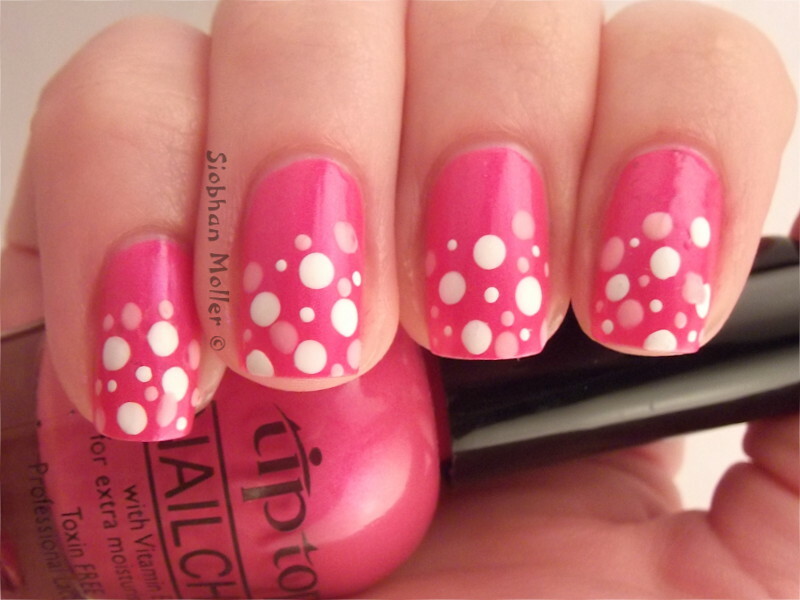 Using a biggish dotting tool and white polish, randomly dot your nails here and there. Then take a smaller, toothpick pointed dotting tool and dot with the white here and there in between the bigger white dots. I used Sinful Colors’ Snow me White. Using the same method in step 4 but use a pastel pink. I used Tip Top’s Melting Marshmallow. Clean your tools with acetone. Keep up with V and her amazing nail art. You can find her on Twitter, Facebook or her blog. Do it!! Awww this is so pretty and girly and pink. Really love the design. I agree Lynette. I LOVE this. It’s so ME! I agree Heather. I am dying to try this out myself now. It’s gorgeous! !